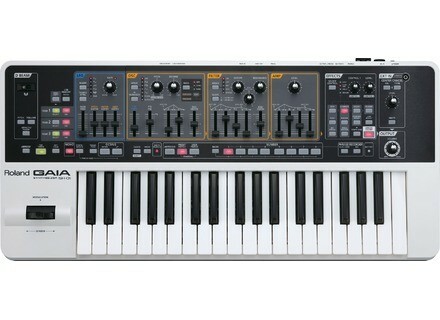 GAIA SH-01, Analog Modeling Synth from Roland. The triple-stacked engine of this synthesizer features a "fun, friendly and inviting" designed to attract first-timers, according to Roland. The signal flow is said to be simple to grasp, with logically arranged knobs, sliders, and buttons. This instrument is designed for music students, songwriters, session players, and live performers of all styles and skill levels. Check out Roland for more details on this product. [Musikmesse] Korg Electribe EMX-1 & ESX-1 SD Korg's pElectribe pattern-based music production stations will now feature new patterns and SD data storage, with the new tube-driven Electribe-MX SD (EMX-1 SD) and Electribe-SX SD (ESX-1 SD). [Musikmesse] Roland Lucina AX-09 Synthesizer The Lucina AX-09 Synthesizer is described as a compact, lightweight synth loaded with sounds, selectable with the onboard Category buttons. [Musikmesse] Korg Monotron Powered by two alkaline AAA batteries, the compact Monotron can be held in one hand.